With New Year’s Eve behind us, it is once again time to look back at how I performed this year. While this wasn’t my best year ever performance wise, I think the achieved result is still way above what I can reasonably expect in the long run. What was interesting this year is that 2015 was the first year with some real market volatility. I always said that I expect that my portfolio would do relatively well when the regular indexes are having trouble. And while that makes sense when you usually run with a net exposure of less than 100% while owning cash-rich stocks (among other things) only the market can test whether or not your prediction is correct. So I’m especially pleased that my portfolio dropped just ~5% in the summer while the MSCI World Index went from roughly +20% to almost -10%. I don’t have exact numbers though since I don’t track this daily. One accounting issue that I should disclose is how I accounted for the value of the Casa Ley and Synergetics USA CVR’s. I simply valued these at zero even though I spend money to acquire them and I think they are worth more. But my broker values them at zero, and I decided that I don’t want to go through the continued trouble to manually correct my performance calculations. Especially since it can take years before they fully pay out, and I might start owning even more of them. If I would be running a fund I think you should be highly skeptical if I made that decision, since I’m now underreporting my performance which could come in handy on a rainy day. So my real performance this year was probably a few percentage points higher (I sized the Safeway merger that generated the Casa Ley CVRs huge!). Even while I underreported my performance from “special situations” slightly it is still by far the biggest contributor to my portfolio performance. When I post a (merger) arbitrage idea on my blog I often get comments from people that think it’s not worth the trouble, that it is picking up pennies in front of a steamroller et cetera. If you don’t think it yourself already, you probably recognize the sentiment. But once you start to add up all the little bits of money you make it starts to make a difference. Even though some merger ideas failed this year (for example, the ROIQ warrants: -100%!) it’s making the difference between an excellent year and just an average year. 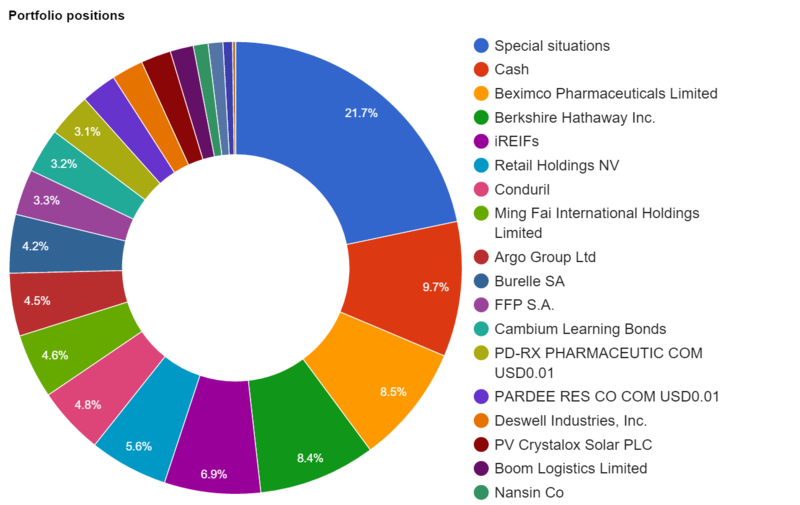 More than 50 different stocks contributed to the special situations total. Without the contribution of those, my performance would be almost equal to the MSCI World Index. This level of concentration has some risks, but I think those are manageable because to a large extent those positions are very uncorrelated. What happens in Bangladesh (Beximco) has almost zero influence on what is going to happen in Angola (Conduril). And besides that, I think those stocks are simply too cheap not to own. But hopefully, I’ll be able to find some interesting bargains in 2016 again. I have been very busy with special situations and my current positions in 2015, but besides buying a basket of Italian REIFs I didn’t buy any other new long-term positions. With an IRR of 18.31% that is an idea that is working out so far, even though (or especially because) I had the feeling that most of my readers weren’t very interested in it. This entry was posted in Portfolio on January 3, 2016 by Alpha Vulture. Congratulations on a great year. I think the most important thing is right in the second sentence: “the achieved result is still way above what I can reasonably expect in the long run”. You always need to keep a clear head, have reasonable expectations and avoid hubris. I attribute most of my overperformance to luck and transient favorable conditions. Also, I see that a major contributor to the performance is due to FX. How much have you thought about this before making an investment affected by foreign currencies? Thanks, and the reality is that I make most of my investments in foreign currencies. I have thought about it, but I don’t hedge it and accept the variance. In the long run, I expect that the currency gains and losses will cancel each other out. Another great result – well done! congratulations, it looks like a great year. In order to have a better understanding of your performance, I think it would be nice to get more details about that special situations’ huge chunk of your portfolio. Of your picks I particularly like Burelle, which now trades at ca 50% discount to its stake in Plastic Omnium, and… the Italian funds. I find the sort-of-arbitrage Beximco a great idea, but the company has a very poor FCF generation which makes me a bit scared. Carry on like this! Happy New Year!! Any comment or opinion on AWILCO? For me, it is currently a position that I don’t spend too much energy on. I don’t think the stock is obviously cheap or expensive, so I’m just keeping my current (very small) position and I’m going to see how it plays out. 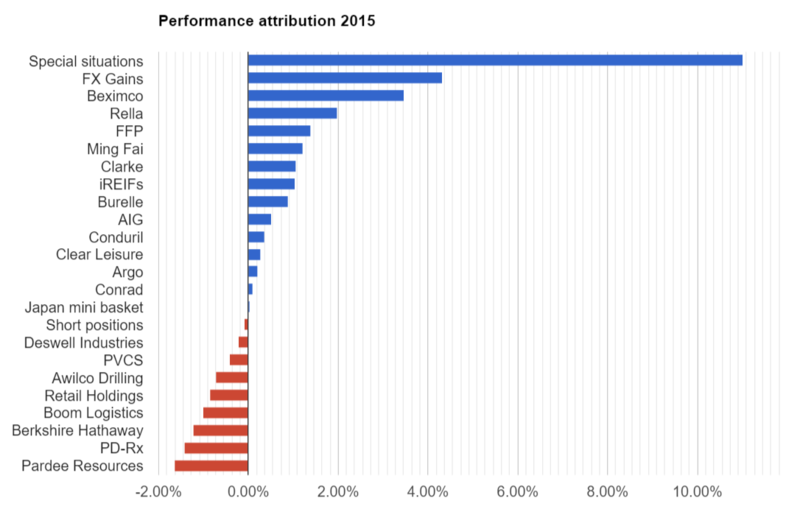 you say your portfolio Dropped ~5% but in the table you show 20.23% increase for 2015? I was talking about a swing during the year, So it dropped from something like +15% to +10% in a couple of months during the summer while the MCSI World index went from +20% to -10%. You show benchmark was up 8.76%? You are probably not looking at the EURO, NET-RETURN index, which was clearly mentioned in the footnotes as the specific benchmark used. So if MSCI ACWI was down 10% how euro brign returns up by 18%? I understand your curiosity, but not willing to do that. Great, and well deserved, results. Congrats! Very impressive results continue finding you! Any possibility to get light on how you get the individual attributions to overall performance? Many thanks, would be nice to see that for own portfolio too. It’s easy to calculate yourself. Let’s say that, for example, you made a total return of 10% while making $10,000. If you have a position that has a gain for $2,500 for the year it would be responsible for 2.5% (2,500/10,000*10%). Do this for all positions and it should add up to 10%, unless you made large deposits or withdrawals (in which case it gets very complicated). Yep, I thought maybe you had a sheet that enabled you to do it even in more complicated scenarios. 🙂 Since my last years have been ones where I’ve moved funds from one account to another, I’d have to try and do this on a “consolidated” basis. Any thoughts as to how (im)possible that’d be? Putting the gains/losses of all accounts together, then looking at all of the positions together and the individual gains/losses similarly to what you describe? Haven’t tried how that works yet, just wondering if you have done it before. The results that you see here are the sum of three different accounts. Don’t think that makes things very complicated. If you use multiple accounts I think you want to know what your result is over all your accounts combined anyway. Check the benchmarks. Couldn’t be its positive close to 10%. Does that mean that your real return is – 5%? Great bit right here. Cheers to another good year. By the way, are you using IB as your broker? Thanks, and yes I use IB for the majority of my transactions. I also use Binck (Dutch broker) that gives me access to some additional markets, and I also use TD Ameritrade for some things. Great performance for the year. Can you talk how do you size your positions in special situations? Do you have strict rules, or depends on the risk of each situation? It really depends on the risk and the reward of each situation. I think the Safeway merger was just before it closed almost 50% of my portfolio while the ROIQ warrants were 0.25% or something like that. But for a normal attractive merger deal without major risks I’m usually between a 2 and 3% allocation. Doesn’t it take a lot of time to keep up with all those merger arbs / arbs in general?